In or Out With Sony Xperia Z Ultra Pocket. The Sony Xperia Z Ultra has just arrived in the office and with a screen size of 6.4 inches, it is clearly one of the biggest smartphones out there. I therefore asked our team: does this even fit in your pocket and would you replace your present phone with it? The answers were surprising, but read them for yourself. It doesn’t stand a chance in Inga’s micro-pocket. It’s seriously bulging! Although I am generally a fan of “Bigger is Better,” the Z Ultra is too big for a smartphone for my taste. It fits comfortably nowhere and seems more appropriate for the backpack than your pocket. The thing felt almost as large as the Nexus 7 and I wouldn’t carry it in my pocket even if it does fit. 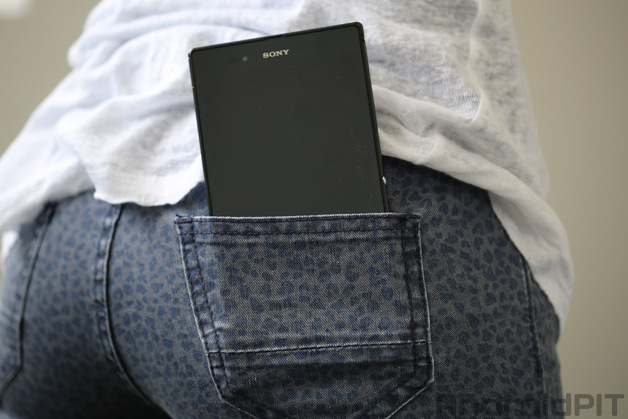 The ultra slim pockets of Loie’s jeans don’t offer enough space for the Z Ultra. However, I can certainly imagine a smartphone of this size for at home, to use on the couch (or in bed). This seems to me to be the best solution but then maybe having two phones is a little too decadent? Almost impossible to see: Georg’s jeans have enough space. The Sony Xperia Z Ultra has a lot to offer: a great battery for long-lasting usage, a lightning-fast and first of its kind processor, plus an impressive and seamless design – but the fact of the matter is, that thing is just too damn big! 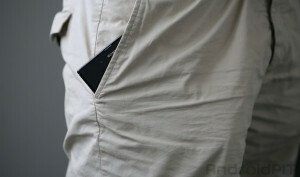 Even tucked into Dennis’ shorts it looks like the Xperia Z Ultra pokes out a bit. 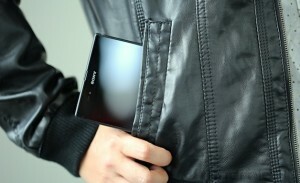 The Sony Xperia Z Ultra is out of the question as a smartphone for me – if only because of its size. 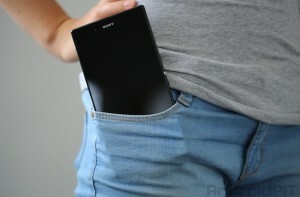 This phablet in the pocket gives a new meaning to the term “ball and chain” for me. Margarita likes to wear skirts and therefore must resort to her jacket pocket. I find phablets very uncomfortable and anything but helpful. I prefer the handiness of normal-sized smartphones, such as with my LG L5. Even though I always have a bag with me, I can at least pop my phone into my pocket quickly and easily. The Sony Xperia Z Ultra has received a lot of praise in our team. Many find the design beautiful and elegant and its power certainly knows how to please. But in your pocket it is simply too large. Considering how often our phones live in our pockets this is a serious consideration. Sophia, on the other hand, can’t wait to buy the Xperia Z Ultra. She is super excited with the device already, ”like a small child,” and she can’t wait to buy one, despite its size.